Alyx dares to find out. She eats strange candy so you don’t have to. 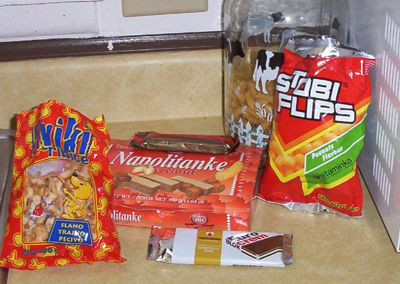 Part 1 of what should be a sporadic series – culinary experiences from the vending machines of foreign lands. This batch hails from Zagreb, Croatia, and I’ve attempted to select a cross-section of savory and sweet Southern European snack offerings. 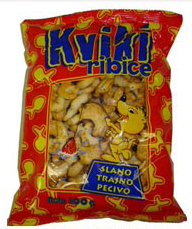 Ratings are on a scale from one to five kunas (that being the currency of Croatia), on a scale with one being effectively unpalatable, and five being an ideal staple of every diet. This was the first product I tried, as I had it on good authority that the chocolate flavored ones weren’t bad. I ate one for dessert after dinner, went out for a run and suffered horrible abdominal cramps. The next day, some combination of bravado and the knowledge that I have no business running on a full stomach anyway led me to conclude it probably wasn’t the Napolitanke, so I had a few more of them. I’ve since finished the box. These are pretty good, if a bit dry, sugar wafers with a thin hazelnut (think Nutella) filling between layers. Good with coffee. Four kunas. Would the rating have been higher if not for the stomach cramps? Maybe. 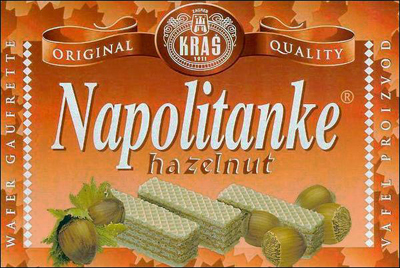 If these first two products are any indication, don’t order dessert in Eastern Europe if you’re allergic to hazelnuts. This is a candy bar with a layer of hazelnut cream sandwiched between two layers of chocolate. I have only one thing to say: Wow. This was good. This is what a Cadbury Cream Egg should taste like. This is the standard to which American chocolate manufacturers should aspire. Four and a half kunas, my only complaint being that the filling could use just a bit less sugar. These are fried corn puffs, flavored like peanuts. I grew up close enough to the Dirty South to think this is an acceptable idea. I ate a handful of these. Definitely edible, good with beer, and you could probably add them to your Chex Mix for variety. 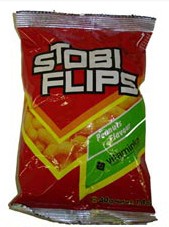 Off-brand cheese puff fans would probably like these pretty well, as they have that over-corned, airy taste. Two and a half kunas. Speckled, Goldfish-shaped crackers. First, I have to give props for the cartoon on the front. They’re seasoned with poppy seeds and sugar. Tasted a bit like bagel chips, except nowhere near as crunchy. A bit powdery and dry. Two kunas; thoroughly unremarkable. Proceed to installment 2 in our candy reviews series: Chinese Candy!